Well, here we are coming up on week two of Penelope’s “I ain’t eatin’ that” hunger strike. We had a “woo hoo” moment where she agreed to eat a leftover can of Prescription Diet A/D that I had sitting around from when Barb sent Bunny to live with us (she had her own “not eating that” phase during her pregnancy. Too bad it didn’t extend to electronics). Unfortunately, A/D isn’t ideal as a food for pregnant girls, and even if it was, Nell had decided by the next morning that she no longer liked that stinky food in can, and could she just have a glass of mineral water with lemon (no ice), puh-leeze? She ate some raw, de boned chicken here and there over the weekend, but not enough to make me confident she was getting enough nutrition, and raw boneless chicken on its own isn’t enough to sustain healthy growth in puppies. Cait suggested a sort of dog food muffin that reminds me of the baked results you get from Essex Cottage Farms dog food mix. Since there are no suppliers of either or ECF food nearby (read: within a two hour drive), I decided to look for home made dog food muffin recipes. The most common one I found was a fairly simple recipe in which you simply added a pound of ground chicken to a commercial corn meal muffin mix. Well, that sounded fairly promising – after all, Penelope was willing to eat those zuchinni banana muffins last week. I don’t like the idea of using a mix, however — I won’t bake for myself from a mix, so I certainly won’t do it for my dog, either. Too much sugar, too much hydrogenated oil, and too little control over the ingredients. 2. Stir together dry ingredients in large mixing bowl. Beat together wet ingredients except for apple, zucchini and chicken in separate bowl. Fold wet into dry using a wooden spoon. Don’t over mix. Add chicken, apple and zucchini. 3. 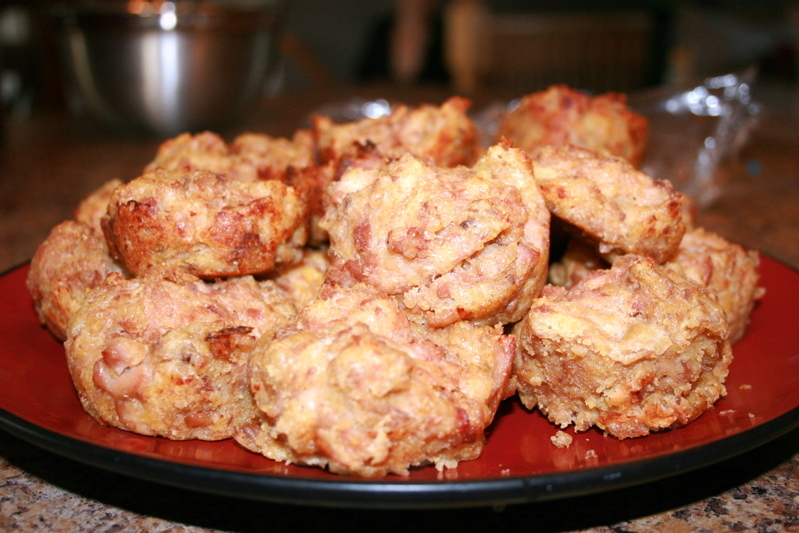 Drop two tablespoons of batter into each muffin cup. Don’t over fill. Bake 20 minutes, or until golden brown. Makes roughly 24 – 36 muffins. So far, so good — Penelope loved hers, Tula reacted to them like they were little golden chunks of doggie crack, and the rest of the dogs looked so sad that they each got a 1/4 muffin with their dinner. These would probably make nice little bait treats, by the way — and they smell quite tasty. Cletus wants a Fussy Frenchie Meaty Muffin. So does Clovis. So does Stone. The Cletus Residence’s last blog post..Another day beneath the yoke? Carol: I can only imagine. While our girls were intact they would go through phases like this depending on their heat cycle. Only no one told us that hormones flip off their desire to eat like that.. And we read EVERYTHING we could get our hands on. Wendy Volhard finally told us. Fuzzy Logic’s last blog post..I’m meeting the surgeon today. I’m so glad she’s eating! Your recipe looks great- I may have to make a batch for Mal & company.